The last few months I have become obsessed with empanadas. I have been filling them with various combinations of meats, cheeses and veggies. I have used store bought dough(Goya / frozen) and carried out experiments with my own dough. I have fried them, I have baked them and best of all I have eaten a lot of them. I have also been talking a lot about empanadas and am surprised how many people don’t know what empanadas are. Empanadas are known by many different names and made many different ways around the world. Below you will find an list of empanadas around the world. An empanada is a Spanish and Portuguese stuffed bread or pastry. The name comes from the verb empanar, meaning to wrap or coat in bread. Empanada is made by folding a dough or bread patty around the stuffing. The stuffing can consist of many things such as meat or vegetables. In Spain, empanadas are usually large and circular in shape and are cut into smaller portions for consumption, whereas in Portugal and South America empanadas are normally small and semi-circular (this type of empanada is commonly known as empanadilla in Spain). Cornish Pasty, baked pastry filled with beef and potato, from Cornwall, England. Bridie, baked pastry filled with spiced beef and onions, from Forfar, Scotland. Karanji from Maharashtra, India. Same idea, but filled with fried & sugared coconut. Gujia from India filled with sugared coconut, nuts & sweet but no meat. Argentine empanadas are often served at parties as a starter or main course, or in festivals. Shops specialize in freshly made empanadas, with many flavors and fillings. The dough is usually of wheat flour and lard with fillings differing from province to province: in some it is mainly chicken in others beef (cubed or ground depending on the region), perhaps spiced with cumin and paprika, while others include onion, boiled egg, olives, or raisins. Empanadas can be baked (more common in restaurants and cities) or fried (more common in rural areas and at festivals). They may also contain ham, fish, humita (sweetcorn with white sauce) or spinach; a fruit filling is used to create a dessert empanada. Empanadas of the interior regions can be spiced with peppers. Many are eaten at celebrations. Bolivian Empanadas are made with beef or chicken, and usually contain potatoes, peas and carrots, as well as a hardboiled egg, an olive, or raisins. They are called salteñas and are moon-shaped pouches of dough customarily seamed along the top of the pastry. Salteñas are very juicy and generally sweeter than the Chilean variety, though there are different levels of spiciness (non sweetness). In the afternoons, fried cheese empanadas are served, sometimes brushed with sugar icing. In Brazil there are two dishes that are similar to what are called empanadas in the rest of Latin America. Pastéis are fried turnovers filled with seasoned ground meat, shredded chicken, cheese, seasoned ground shrimp, hearts of palm, and various other fillings. Empadas are pies made with a rich buttery crust. A large empada often can serve as a main course, whereas small ones called empadinhas are often consumed as snacks. Common fillings for empadas and empadinhas include shredded chicken, hearts of palm, and shrimp. The fillings for empadas and empadinhas often contain olives and tomato sauce. Cape Verdean cuisine features the pastel as well. Cape Verdean pastéis are often filled with spicy tuna fish. One particular variety, known as “pastel com o diabo dentro” is particular spicy, and is made with a dough made from sweet potatoes and cornmeal. Chilean empanadas can have a wide range of fillings, but there are two basic types; one is baked and usually filled with pino (similar to mincemeat), and the other is usually filled with seafood. Empanada fillings may contain cheese and/or different types of seafood, for example; mussel, crab, prawns or locos (abalone). The most popular empanada filling is pino, consisting traditionally of beef, onions, shortening, raisins, black olives, hard boiled eggs and hot peppers. Pino is a Mapuche recipe, and in Mapudungun it is called Pinu, so this filling is a true mix of indigenous Chilean and Spanish heritage. Colombian empanadas can be either baked or fried. The ingredients used in the filling can vary according to the region, but it will usually contain components such as salt, rice, beef or ground beef, shredded chicken, boiled potatoes, cheese, hard-boiled eggs, and peas. In the department of Valle del Cauca, they are generally filled with ground meat, yellow potato or Creole potato. They are also served with peas, tomato, cilantro, and many other spices. In the city of Medellín, Chorizo filled empanadas can be easily found, because of the city’s love of pork and chorizo meats. In the Amazonic regions of Colombia, such as the area of the city of Leticia, many sweet empanadas can be found, because of the high demand and high supply of tropical fruits of the region. Many of these empanadas are filled with some sort of jam consisting of these types of tropical fruits, such as lulo, zapote and many more which can all be found in the Amazon regions of Colombia. However, radical variations can also be found (cheese empanadas, chicken-only empanadas, and even Trucha – Trout – empanadas). The pastry is mostly corn-based, although potato flour is also used. In Santander, wheat flour pastry is the most popular with a variety of fillings that may include pineapple and even mushrooms, but the empanadas of ground or puréed manioc (stuffed with rice and shredded chicken or minced meat and, usually, chopped hardboiled egg and cilantro) are a representative traditional food. Colombian empanadas are usually served with Aji (also called Picante and Ají Pique by some people), a sauce made of cilantro, green onions, red or black pepper, vinegar, salt, and lemon juice and, often, bits of avocado pear. Bottled commercially made hot sauces are also used to add flavor to the empanadas. The sauce is normally prepared with a spicy kick, balancing very well with the nutty, neutral taste of the meat, potato and spices that make up the typical Colombian empanada. Colombian empanadas are also known to contain carrots and chicken. Another variety include Stuffed Potatoes (Papas rellenas) which is a variant that has potato in the pastry instead of maize dough and have round shapes. In the Cauca department, the pipian empanadas are made with peanuts and a special type of potato called “Papa amarilla” due to its yellow color. In Colombia, empanadas can be easily found on street corners, as it is one of the most famous and popular foods in the general public, followed by Arepa, and Pandebono. Many of the empanadas that are found in Colombia were/are homemade, and have been brought down through generations, eventually turning into a national obsession. One of the most famous bakeries in the Republic, more specifically based in Cali, Colombia, called ‘El Molino’ introduced the Spinach Empanada, which is an empanada filled with both green spinach and cottage or Riccotta cheese. In the poorer areas of Colombia, the producers of these popular empanadas are made with the same spinach, but use Queso Campesino, Queso Paisa of Medellín, or parmasan cheese instead of cottage or Ricotta cheese. Empanadas in Colombia are a favorite in most of the bigger cities, such as Cali, Bogotá, or Medellín. Nowadays, Colombian empanadas are one of the most ordered, and one of the most favorable side orders in many of the restaurants in Colombia. Costa Rican empanadas are either filled with seasoned meats (pork, beef or chicken) or cheese, beans, cubed potato stew folded and then fried. These empanadas are normally made with corn dough. There is another version made with wheat dough and is typically sweet and baked, filled with guava, pineapple, chiverre or any other jelly or dulce de leche. Another popular version are empanadas that have been made with sweet plantain dough, filled with seasoned beans and cheese, and then fried. Cuban empanadas are typically filled with seasoned meats (usually ground beef or chicken), folded into dough, and deep fried. Cubans also sometimes refer to empanadas as empanadillas. Empanadas can also be made with cheese, guayaba, or a mixture of both. It can also be made with fruit such as apple. pears, pumpkins and pineapples. These are not to be confused with Cuban pastelitos, which are very similar but use a lighter pastry dough and may or may not be fried. Cubans eat empanadas at any meal, but they usually consume them during lunch or as a snack. Similar in their preparation (though often fried) and method of consumption to Cuban empanadas. More modern versions, promoted by some specialty food chains, include stuffing like pepperoni and cheese, Danish cheese and chicken, etc. A variety also exists in which the dough is made from cassava flour (or wheat flour), called catibías. Adobo seasoning, diced boiled eggs and raisins can be added as way to provide additional variety and enhance the flavor of the meat filling. Very similar to those of their neighboring country, Colombia, Ecuadorian empanadas are made of corn seasoning or flour. Their components may include peas, potatoes, steamed meat known as carne guisada, or many other varieties of vegetables. The many types of Ecuadorian empanadas include empanadas de arroz (rice empanadas), which are deep fried for added crispiness, and flour empanadas or empanadas de verde which are empanadas made from plantain. Empanadas are also followed by aji (a type of dipping sauce for added flavor), which varies by region. The major components of “aji”, or “picante”, as it is also known, are cilantro, juices from red peppers (for a spicy kick), lemon, Spanish, red, or green onion, and sometimes chopped tomato. In la costa , or the shore region of Ecuador, aji may contain only onions, chopped tomatoes, and lemon juice. and fruit empanadas; with such fillings as banana, apples, and pumpkin. There is also “empanadas de morocho”, morocho is a special grain produced in the country. They are also known for deep fried Empanadas made with shredded chicken, onions, olives, hard boiled eggs, and raisins then topped with sugar before serving. In Ghana, traditional-style empanadas called “meat pies” are made with a pastry shell and corned beef filling. In Haiti, a meat-filled pastry similar to the empanada but with a thicker crust called a pate is regularly eaten on festive occasions. It is essentially a meat-filled turnover. The dough is often filled with ground beef, fish, or chicken and topped with spices. The dough is then sealed and baked. In Indonesia it is known as panada or pastel tutup. The Northern Celebes version, called panada, has thick crust and is filled with spicy tuna and chilli peppers. The other less spicier version, called pastel tutup, has thinner crust and a filling typically made of finely diced potatoes, carrot, green onions, chicken, garlic, and white pepper. A less common version can also be found, filled with curried chicken and/or potatoes with one quail egg. A Jamaican patty or pattie is a pastry that contains various fillings and spices baked inside a flaky shell, often tinted golden yellow with an egg yolk mixture or turmeric. It is made like a turnover but is more savory. As its name suggests, it is commonly found in Jamaica, and is also eaten in other areas of the Caribbean, like Costa Rica’s Caribbean coast but most notably that of Haiti, in which the pastry is thick and crispy essentially a turnover. It is traditionally filled with seasoned ground beef, however, fillings now include chicken, vegetables, shrimp, lobster, fish, soy, ackee, mixed vegetables or cheese. In Jamaica the patty is often eaten as a full meal especially when paired with bread. It can also be made as bite-sized portions and is then referred to as a cocktail patty. The Chamorro people of Guam and Saipan make an empanada that is filled with ground toasted rice, red chilis, black pepper, garlic and annatto. The pastry is made from masa harina and it is deep fried. Mexican empanadas can be a dessert or breakfast item and tend to contain a variety of sweetened fillings; these include pumpkin, yams, sweet potato, and cream, as well as a wide variety of fruit fillings. Meat, cheese, and vegetable fillings are less common in some states, but still well-known and eaten fairly regularly. Depending on local preferences and particular recipes the dough can be based on wheat or corn, sometimes with Yuca flour. The state of Hidalgo is famous for its empanadas, or pastes, as they are locally known. These trace their origins from the Cornish pasties imported by British miners. In Chiapas, empanadas filled with chicken or cheese are popular dishes for breakfast, supper or even as snacks. In Nigeria, these pastries are commonly referred to as “meat pies”. They are usually stuffed with carrots and greens with the meat being either beef or chicken. Empanadas are usually filled with ground beef but sometimes may also be filled with shredded chicken, white cheese or yellow cheese. They are made of flour or cornmeal and usually deep fried, but can also be baked. In the city of Colon, due to a heavy Caribbean influence, they also fill it with a plantain puree, bake it, and call it “plantain tart” (tarta de platano). They are smaller than their counterparts elsewhere in Latin America and are considered snack, appetizer, or luncheon food. Peruvian empanadas are similar to Argentine empanadas, but slightly smaller. They are usually baked. The most common variety contains ground beef seasoned with cumin, hard-boiled egg, onion, olives and raisin; the dough is usually sprinkled with icing sugar. They are commonly sprinkled with lime juice before eating. Also very popular are cheese-filled (or cheese-and-ham-filled) ones besides chicken filled one. Recently, “modern” empanadas, with a variety of filling have appeared, e.g. : chicken-and-mushrooms, shrimp or “aji de gallina”. In southern Peru, similar to Bolivia, you will also find “Salteñas” (Argentinian empanadas) or “Bolivianas” (very similar to Salteñas). Filipino empanadas usually contain ground beef or chicken meat, potato, chopped onion, and raisins (somewhat similar to the Cuban “picadillo”) in a sweetish wheat flour dough. Some Filipinos are not partial to the sweetish flavour notes and prefer empanadas that are closer to the Hispanic versions. There are doughy baked versions, as well as flaky fried versions. Often, to lower costs, potatoes are added as a filler. However, empanadas in the northern Ilocos region are very different. These empanadas are made of a savory filling of green papaya, mung beans and, upon request, chopped Ilocano sausage (Chorizo) and/or an egg yolk. Rather than the soft, sweet dough favored in the Tagalog region, the dough used to enclose the filling is thin and crisp, mostly because Ilocano empanada uses rice flour, coloured orange with achuete (annatto), and is deep-fried rather than baked. In Portugal, empadas are a common option for a small meal, found universally in patisseries and often being eaten while drinking coffee. They are usually about the size of a golf ball, though size and shape changes from place to place or establishment to establishment. The most common fillings are chicken, beef, tuna, codfish and, more recently, mushrooms and vegetables, though this also varies from place to place. They aren’t usually served hot. Puerto Rican cuisine has several dishes related to the empanada. The closest to those of neighboring countries is called empanadilla (literally ‘little empanada’; it also known as pastelillo in and around the metropolitan area). The empanadilla is made of flour or cassava flour dough, lard and annatto powder. The empanadilla is filled with meat (chicken, picadillo, chorizo, turkey, etc), spinach, pigeon peas with coconut, cheese, or a combination, or cheese with fruit. Cassava empanadas are usually filled with seafood. They’re very popular beach food and in Cuchifrito. In Spain empanadas are often made from a rather thin, pliant, but resilient wheat pastry, although thicker pastry is not uncommon. The filling varies, but tuna, sardines or chorizo are used most commonly in a tomato puree, garlic and onion sauce. Spanish empanadas are fried in olive oil or baked in the oven. In Galicia, Spain, the empanada can also be prepared similar to a pie, with cod fish or pork loin, the empanada galega (Spanish: empanada gallega). Empanada can be eaten at any time of the day. Creole cuisine empanadas are commonly eaten in the United States, especially in the South and the Southwest. 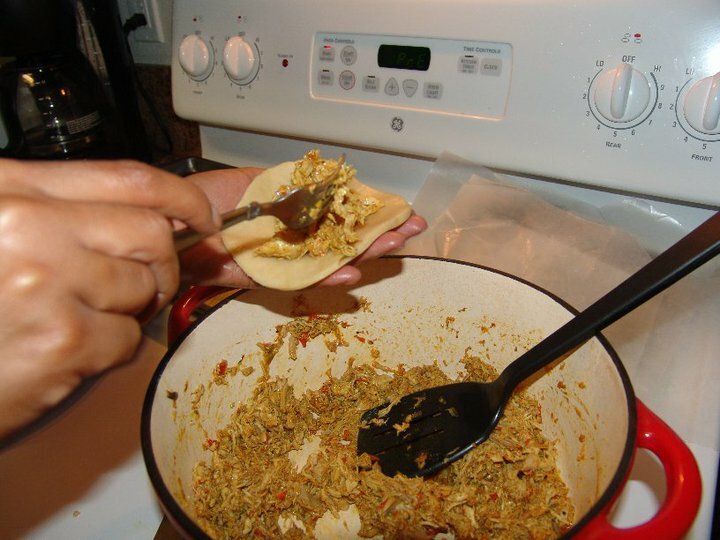 In Louisiana empanadas are creole savory meat pies, commonly made in Louisiana by Creoles in South and North Louisiana. They are a half circle flaky crust, filled with seasoned pork, beef, chicken, and cheese. In the southeastern United States, there is a similarly prepared dessert often referred to as “fried pies.” They typically consist of a pastry filling made from re-constituted dried fruit such as apples, apricots, peaches or yams. The filling is placed in a dough circle, folded over in half, and then fried. 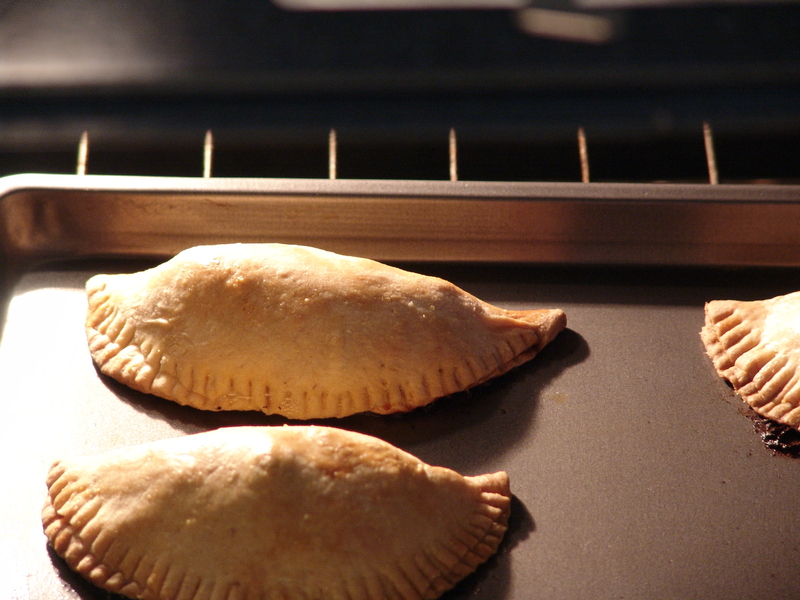 Uruguayan empanadas are generally made out of wheat flour and can be fried or baked. There were introduced by the Spanish and Italian settlers in the middle of the 20th century. The most common empanadas are those with beef, but there are also other kinds, such as ham and cheese, olives, fish and spicy stuffing. The most famous sweet empanadas in Uruguay are those that combine dulce de leche, quince and chocolate covered by sugar or apple jam. In some regions even those with sweet meat. Venezuelan empanadas use corn flour based dough and are fried in oil or lard, but can be baked too. The stuffing varies according to region; most common are white salty cheese, shredded chicken or beef and ground beef. Other types use fish (shredded school shark or cazón, very popular), caraotas or black beans, Llanero white cheese, guiso (meat or chicken stew made with capers, red bell peppers, tomatoes, onions, garlic, olives, panela, red wine, and Worcestershire sauce). Oyster, clams, shrimps and other types of seafood are used as fillings in the coastal areas, especially in Margarita Island. Also, it can be made of fried ripe plantains (tajadas) and white cheese, which has a sweet flavour. An empanada filled with meat, black beans (Venezuelan-style), and fried ripe plantains (tajadas) is called empanada de pabellón, after Venezuela’s national dish, the pabellón criollo. When the empanada is cut open after deep frying, and doctored with added fillings, it is called empanada operada, a term which refers to a surgical intervention (operación in Spanish). The empanadas can be eaten at any time of the day and is frequently served with Guasacaca and/or hot sauce. In order to distinguish the types of empanadas in Venezuela, it is common to call Empanada Chilena the one that is made with a wheat flour based dough (or pastry) and baked, as Venezuelan empanadas are made with a corn flour based dough. 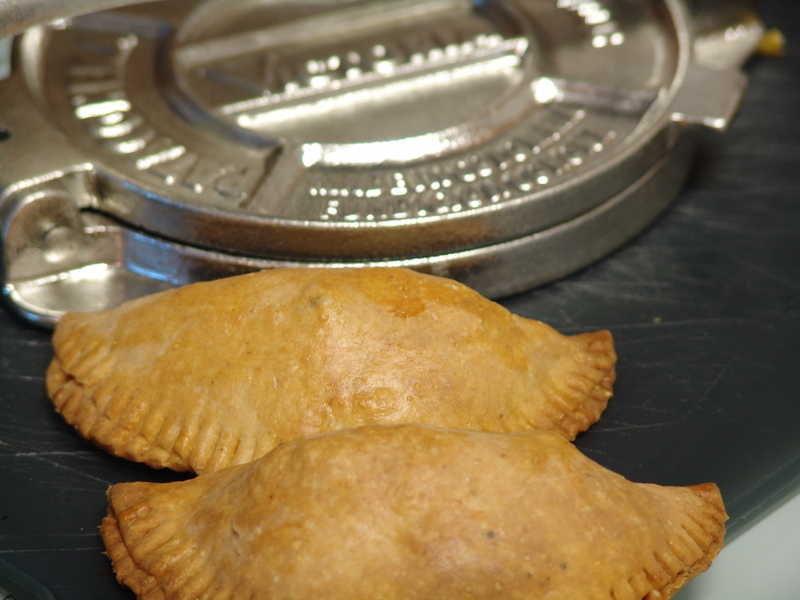 The Virgin Islands version of empanadas are called patés. They are served as a snack or street food. Filled with beef, chicken, saltfish, conch, lobster or vegetables, pates are made with flour and are usually fried. This is great! I love empanadas too. Thanks!